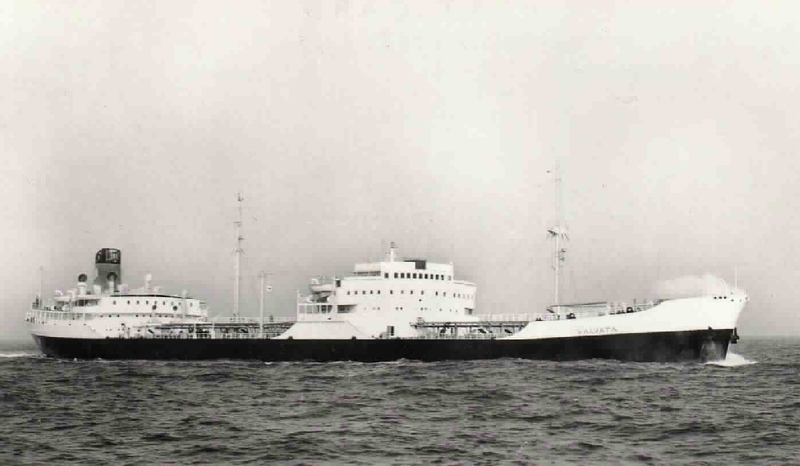 Completed 1960 as San Conrado for Eagle Tanker. 1960 purchased by STUK. 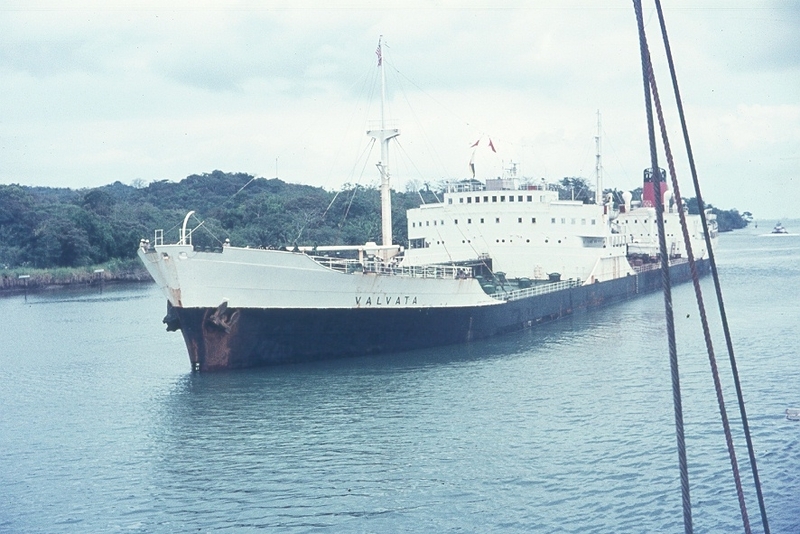 1965 renamed Valvata. 12-4-1975 arrived Bilbao for scrap. I flew out with two other blokes to join the Valvata a Shell tanker as a fireman/greaser in Piney Point in August '71, the only bad ship I ever sailed on. I remember getting logged before I'd even signed on. That must be some record! They said the ship was jinxed and after a few weeks I could understand why. Apparently a crew-member had died just before I joined so I wasn't off to a very good start. We were out from BA heading for Sweden, I think it was and I was on watch in the engine room when I heard an almighty scream from down below. One of the blokes I joined with was a first tripper from Nottingham, just a young fellow, I think he'd just come out of the army. Most of the blokes working in the engine room just wore cut-down jeans but this chap was very safety conscious and always wore a boiler suit. He was painting the turbine when his boiler suit got caught on a lug on the rev counter. It whipped the boiler suit from him and tore his arm off mid-way up his forearm. He was more concerned with covering his nakedness than anything else, obviously in shock. We diverted to San Juan and he was taken off, I'd love to know what happened to him. Not too long after that a close relative was killed in a plane crash and I paid off. Just wandering if anybody sailed with my father and mother Rodney and Christine Davies in 1972-74. Interested in hearing from people who have and keeping in touch. Always remember the panic onboard prior arrival Brest -certain wifes joining and happen to be nurses. Last Port of call 'A la Campo'. Valvata had lost her bilge keels and rolled like a pig all the way across the Atlantic. Always remeber the record player - only 2 albums - The Who and Focus - still play them today! must have been an uneventful trip cant rember much to date. Any clues out there. In those days the Japanese port authorities didn't work at night so by the time we had finished discharging at each berth it was too late to move until the following morning. Us deck Officers broke watches. On the 3rd night the other junior officers persuaded my wife & I join them as they had found a great bar. As soon as we sat down a hostess sat with each of the other four lads. I was stuck with the wife. Shirley and I love dancing so we had a couple of dances. A Japanese gent comes up to our table with 5 bottles of beer to which us a happy Christmas. He than asks me if he could have a dance with my wife and she kindly obliged. As soon as she got up a hostess sat next to me. My wife is a peroxid blond 5ft 7ins plus high heels and with the Japanese being short. After a couple of circuits of the floor she kicks her high heels off. The Japanese thought this was hilarious. We then had a succesion of Japanese bring beers to our table and asking me if they could have a dance with Shirley. We gave her plenty of encougement "You're doing a grand job - keep going". Next we have hot food placed on the table. When it was aproaching closing time the bar staff told us to sit tight while they cleared up. The staff then took us back to an apartment typical Japanese with bamboo doors etc. In the middle of the floor was a well which was heated. So we all sat on the floor with our feet in the well. A quilt was placed over our legs then a board/table on top of that for our glasses of beer. They told us if we had to get up then carefully lift the quilt as the smell of so many feet would be overpowering. Our feet were nice and warn but our backs were very cold. We got back to ship about 4am, a good night had been had by all. Valvata part 2. At the night club we had a floor side table. A part bottle of whiskey was produced with the colonel's name on it so he must be a regular. That bottle was polished off and a fresh one appeared. Floor show was very good with a belly dancer, conjourer and other acts. To eat we had a whole chicken with the bone filleted out. We left about 3am. We had to be up and out of the hotel at 8am to catch the 1030am flight to London. We came down stairs with match sticks between our eye lids to be greeted by our ship mates saying "Its alright for some we had to sit there nursing a beer all night". There Shirley and I were that night at 6 pm sitting in our front room having been in a Bagdad night club at 3 in the morning. If anyone remembers this we would love to hear from you. Valvata Part 1. My wife & I had many adventures on the Valvata 1965/66. The best one was when we left the ship at Khor al Amaya at the entrance to the Shatt al Arab river. Seven of us left the ship homeward bound. We had a two hour launch ride to Fao and then had to travel in two taxis across the desert to Basra. This was in February, belief it or not the desert was flooded - yes flooded. All you could see was a shimmer of water not a sign of sand anywhere except for the muddy tack that was supposed to be a road. We slithered and slewed our way for 6 hours with the taxi driver hoiking (spitting) out of the taxi window every 5 minutes. We arrived at Basra airport hotel at about 9 pm. It was a beautiful colonial style building no doubt destroyed by now.The next morning we flew to Bagdad and had to stay overnight for the following days flight to London. Coming out of Bagdad airport to the taxis Shirley suddenly starts shouting "It's Brian, it's Brian". Brian was a chap from our local pub, he was of our parents generation. He was in the Dam Buster Squadron as a rear gunner. We were very privilged to have known this man. It was great seeing him on TV in a repeat of the anniversary of the raid. It brings tears to my eyes talking about him. He says "what hotel are you staying in"." We said the Bagdad International". "So am I see you in the Bar".After checking in Shirley & I went to the bar Brian asks us what we would like to drink. I explained that we could't return his hospitality as we did't have any money this being the days before credit cards and no one ever has a sub in Iraq. No problem he says, I'm on expenses. We then went into lunch, Brian said his business contact would be joining us. An Iraqi Colonel turns up, he and Brian discuss their arrangements for the following day. Brian then turns to this Colonel and says "My friends & I would like to go to a night club tonight". I whisper to Brian that we hadn't got any money. Shut up he says. After our siesta we met up in the bar with our ship mates. We pooled our money to buy a round. If you take todays cost of a pint at ?2.50 a beer there it cost ?20. Brian appears and buys everyone a couple of rounds. Our Colonel turns up at 9 pm and whisks us off to this night club. I joined the Valvata in Gothenburg in April 1969. It was the first time I had ever been abroad. We discharged half the cargo and sailed down to Malmo to off-load the rest. We then sailed to Venezuela and I remember getting sunburnt to a crisp. On the way back we were exiting the West Indies when the pumpman was struck by a wave on deck and broke his leg between two pipes. We had to return and sail to Puerto Rico. We endeavoured to transfer the pumpman to the pilot boat outside the harbour but the swell was too great. With pilot on board we entered the strait leading to the harbour. We were quite a large ship and we failed. In the narrowest part of the strait we ran aground and completely blocked the harbour for the next 24 hours. There were cruise ships wanting to depart and other wanting to enter but no one could get in or out. One medium size cargo ship did try but collided with us instead. News helicopters flew overhead and we were the major item on all the broadcasts. We shifted the cargo and had six tugs trying to pull us off. Eventually, we the help of a huge ocean-going tug, and a line that must have been a 400m in length and as thick as a tree trunk, they managed to pull us off the sandbank. When we arrived back in Gothenburg, the Captain was taken off for a Broad of Trade enquiry but he was acquitted of any blame. Have you sailed on Valvata? Log in and add yourself as a sailor to the Valvata! Log in and add your personal story to the Valvata!